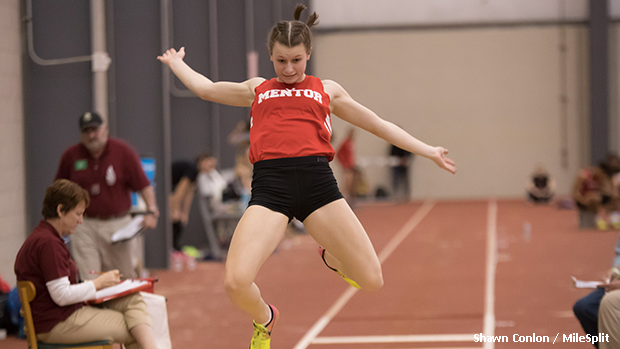 Paige Floriea has big goals in mind for the 2019 indoor season and beyond. Can you describe Paige as an athlete and provide some insight about what it's like to coach her? "I have known Paige since she was in the 6th grade and I can say she's one of the hardest working athletes that I have coached. She currently works out with the varsity football team at Mentor and she's enrolled in the football / sports conditioning class. She completes the same workouts that all members of the team do." "Paige is well aware of Tianna Madison and what her all-time state mark is. In order to become the state champion and to have a shot at Madison's record, she knows there is a lot of work ahead of her and she's ready to take on those challenges."